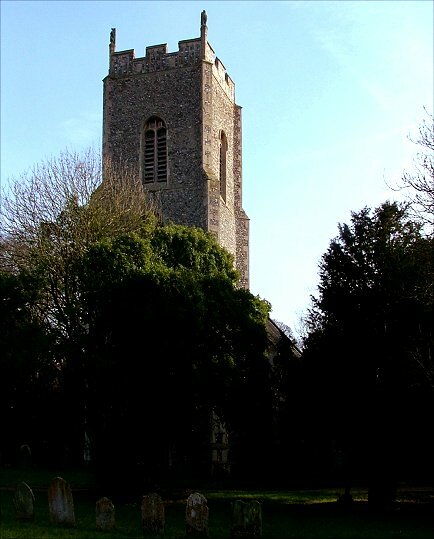 If Norfolk has a heart, then I'm sure it must reside in the rolling landscape to the west of Norwich, in the fields and copses around Dereham and Wymondham. Occasionally there's a busy road, but mostly its just little lanes that wind and stagger, following ancient field patterns or the forgotten boundaries of some long-dead squire's proud acres. Today it is mostly quiet farming country, with the occasional hotel or golf course to remind us how close we are to Norwich. 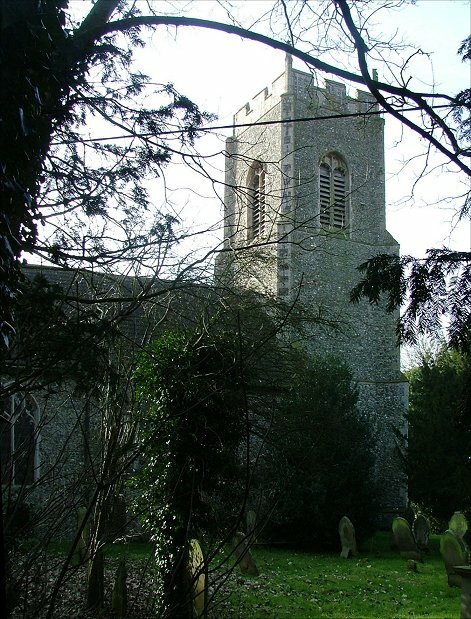 Nowhere, apart from Wymondham and Derham, is of any size, and the only buildings of any consequence are the churches. 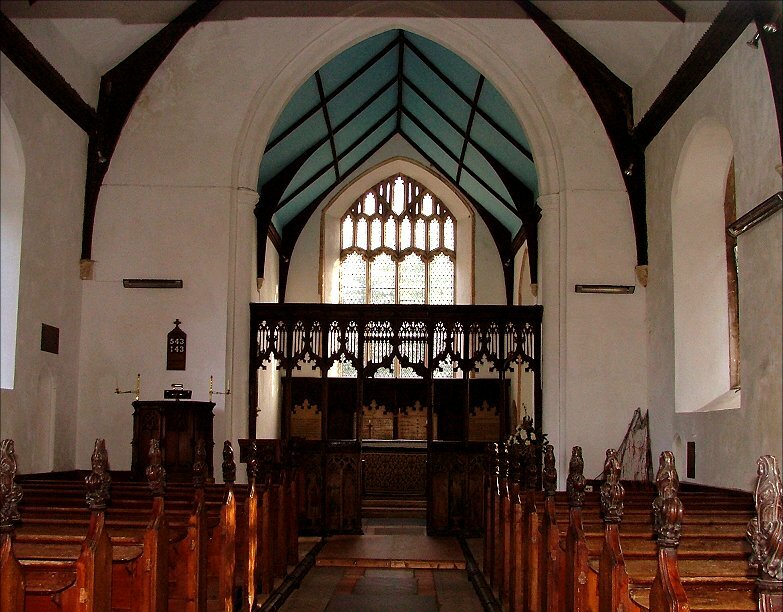 Especially at Barnham Broom, where the church is of great consequence. 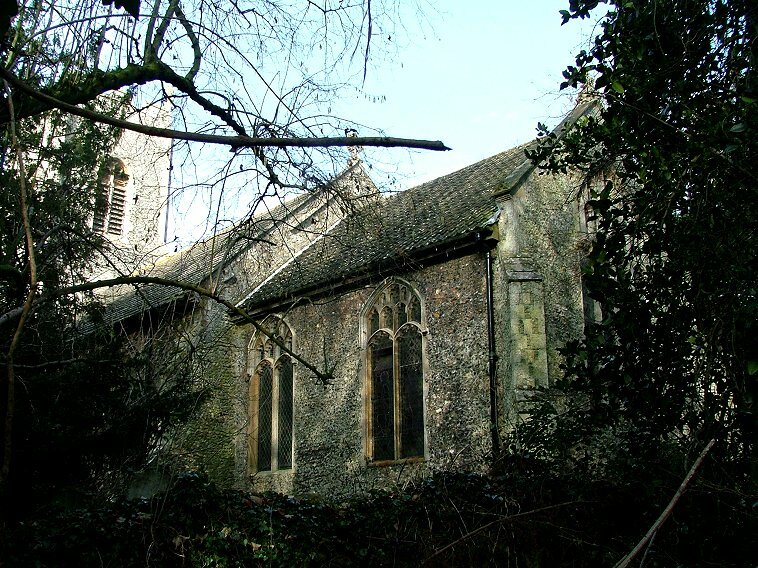 Although the western extension to the graveyard is flat and open, the trees encroach upon and enfold the church itself, and the eastern end of the graveyard falls away into thick woods that make a view of the church from this end impossible. 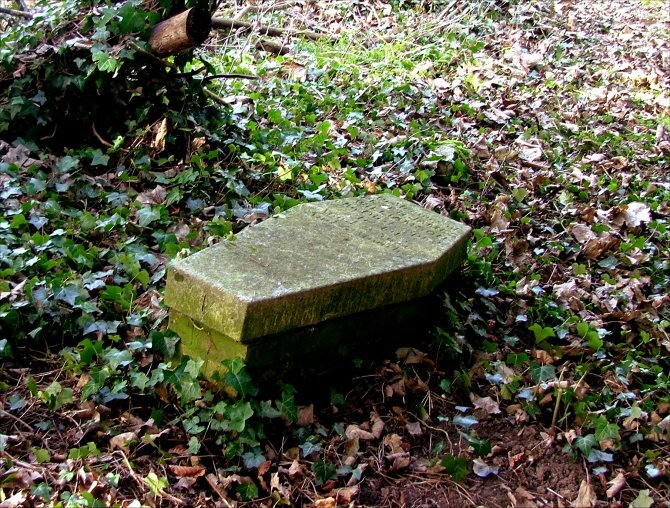 The ground is lush with elder and ivy, and a poignant little child's grave floats like a buffeted boat among the trees. You seem to step over a boundary immediately to the east, and I wondered if this was into the edge of the park of some great Hall, now lost to us. 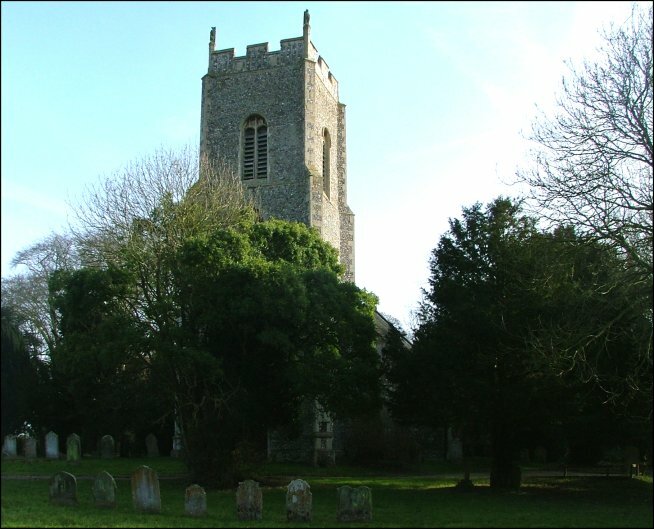 The structure of St Peter and St Paul, as with so many big East Anglian churches, is almost entirely the work of the early 15th century. Pevsner records bequests for the tower and bell in 1434 and 1440, so this may be a clue to the finishing date of the rebuild. Some 450 years later, the 19th century restoration was considerable; but the Victorians weren't the first, and so you step into an interior that is clean, bright and has a feel of the early 1800s as much as anything later. 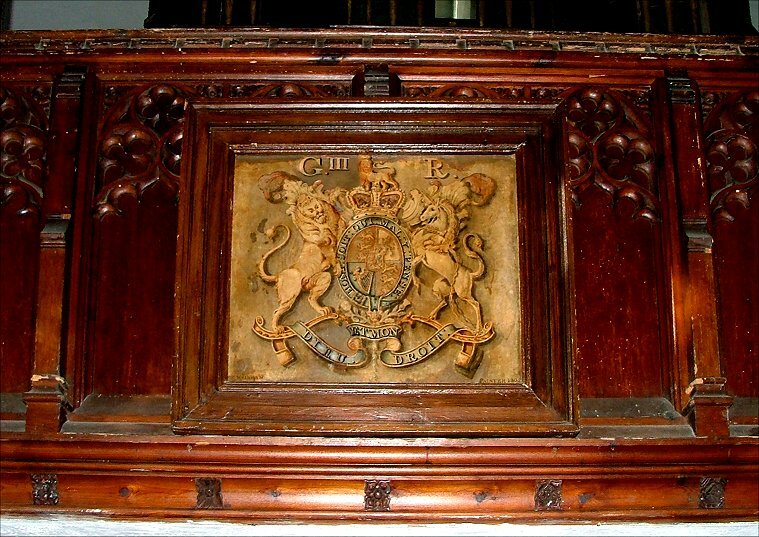 This is accentuated by a deep, uncanted gallery with the arms of George III on the front, probably a clue to its date. 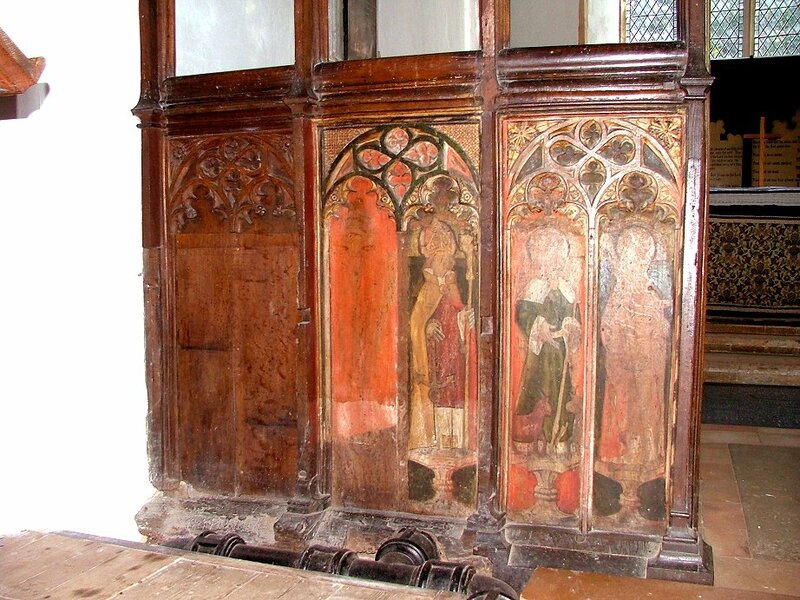 Barnham Broom's great surviving treasure is the roodscreen, probably contemporary with the rebuilding of the church in the 15th century. 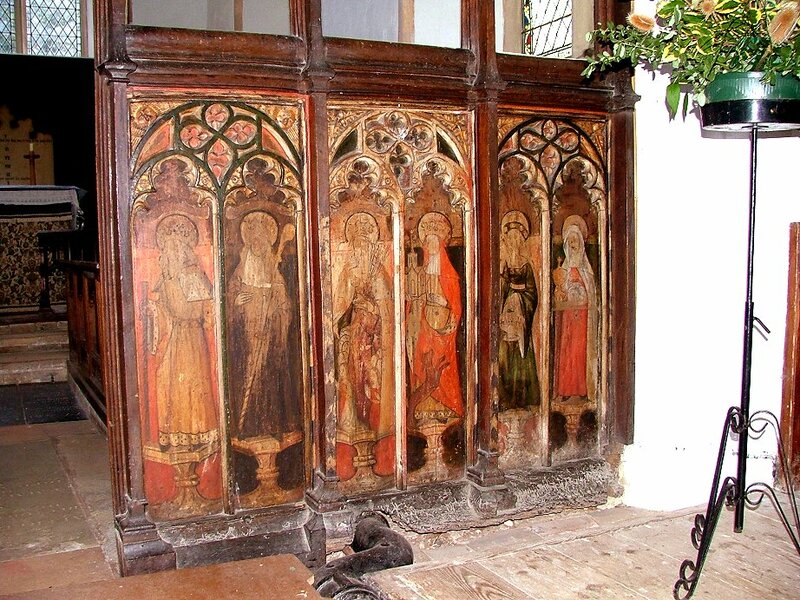 A curiosity is that it appears to have been left unfinished, despite predating the Reformation by almost a century. There are several screens like this in Norfolk, and several theories. 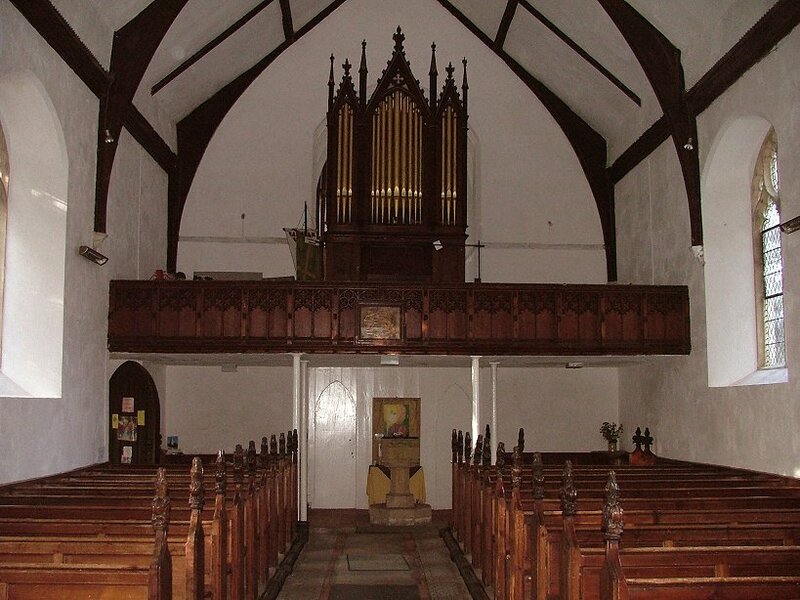 It may be that there was a nave altar in the north-west corner that covered part of the screen. Perhaps the way that the uprights have been cut into on this side, and the division bar in the first two boards removed, is a clue. On the north side, the first two panels are blank. 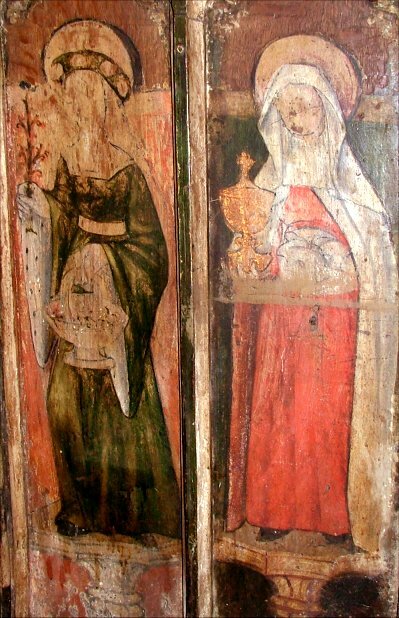 The third has a shadow of a figure, but if you look carefully you can see that it was wearing a triple crown, and is therefore St Gregory. 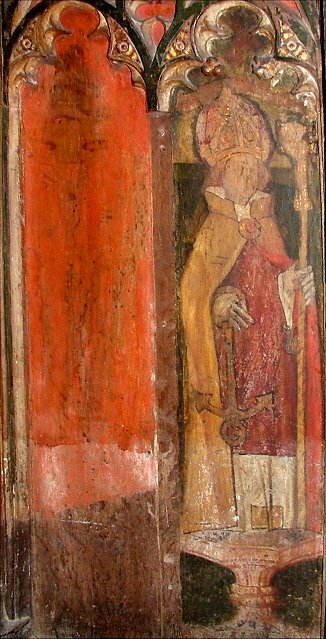 Beside him, St Clement holds an anchor. 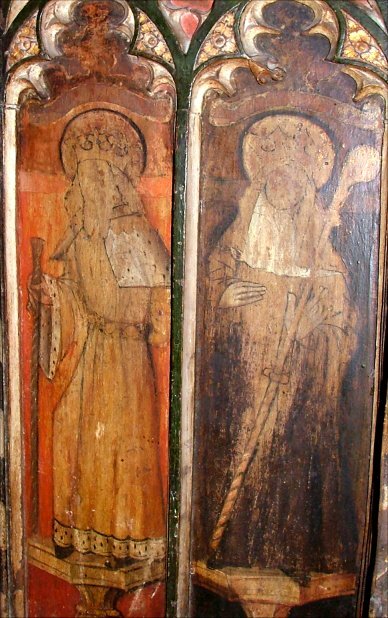 The last two figures on this side are St Walstan, who came from nearby Bawburgh, and an unidentified Bishop. 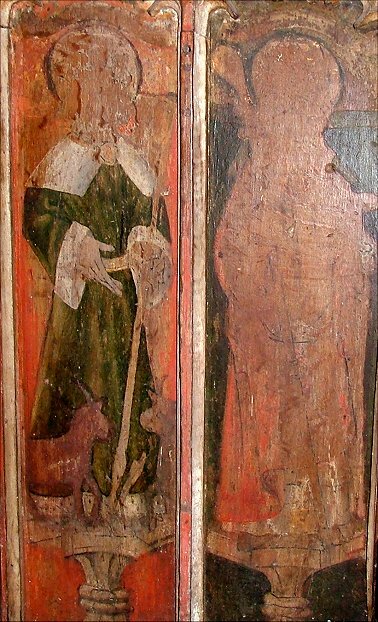 On the south side there are six complete figures: St Edward the Confessor (making it likely that the Bishop in panel VI is St Thomas of Canterbury), St Etheldreda, St Ursula with her virgins sheltered at her feet, St Withburga of nearby Dereham holding a church, St Dorothy holding flowers and a basket, and a final figure holding a chalice and some loaves. Mortlock thought she might be Elizabeth of Hungary or St Joan de Valois. 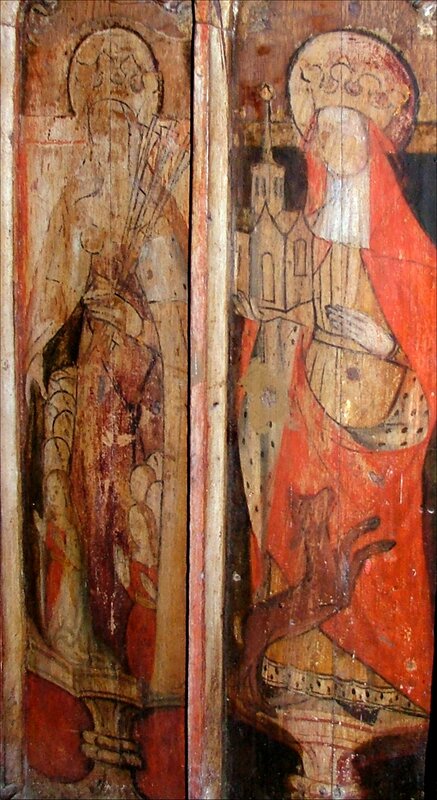 Neither is likely, although St Joan de Valois is also suggested for a difficult character on the screen at Upton. I couldn't help thinking that she looks a little like a woman about to celebrate Mass, but I put this thought from me, not wishing to appear controversial. 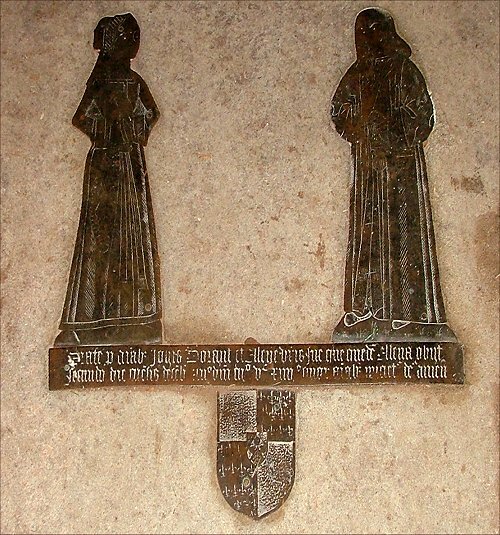 There's a double figure brass in the middle of the nave to John and Ellen Dorant. They died in 1503, and the unvandalised inscription asks for prayers for their souls, a request that would stand for barely forty years before it stopped being met. 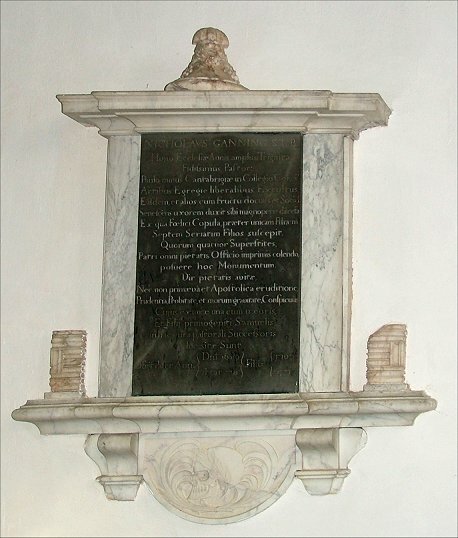 A couple of centuries later, the memorial to Rector Nicholas Canning and his son on the chancel wall appears incomplete, but the little stacks of books on each wing are rather sweet. 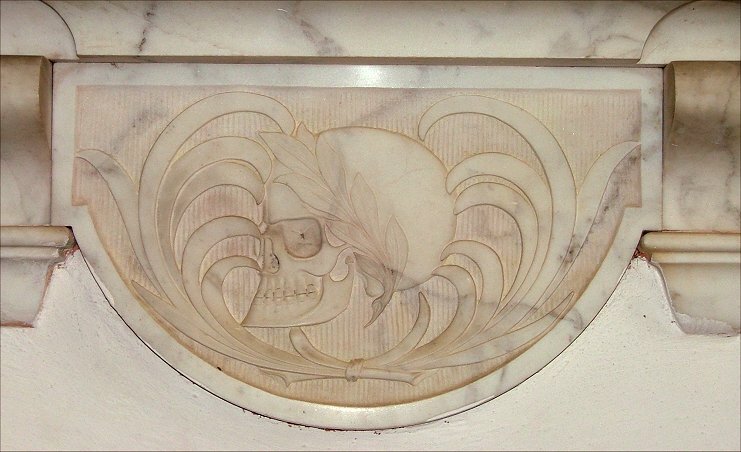 The laurelled skull at the bottom is grinning, as if it knows something that we don't, which is probably right. Although the roofs are not old, the corbels are. 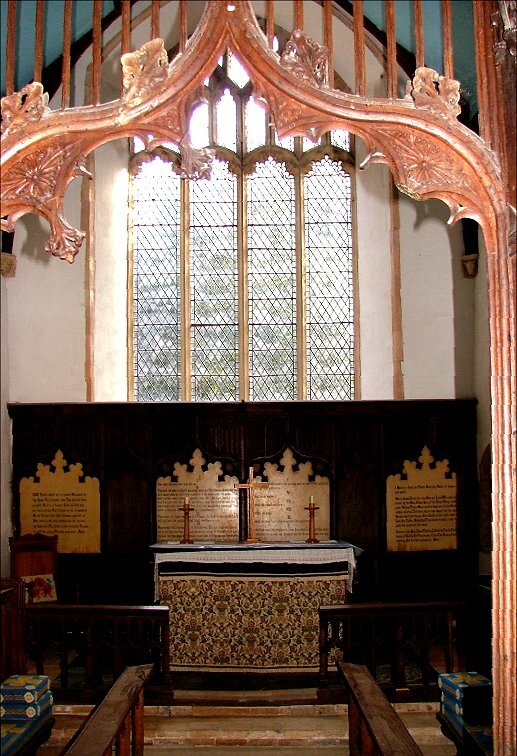 Those in the chancel are in the form of shields, and that in the south-west corner is rather curious. 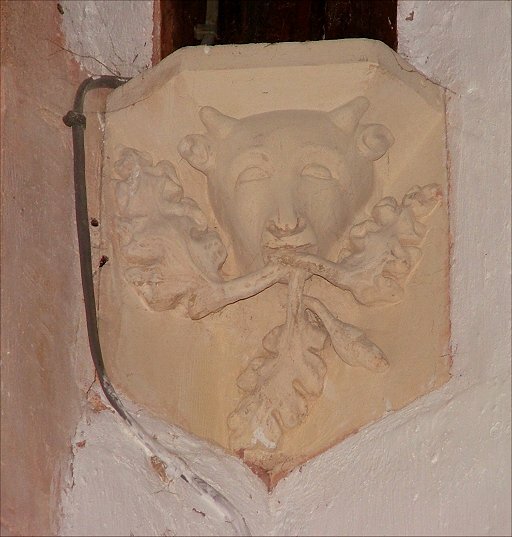 A horned face, which might be an ox but might also be human, has leaves growing out of its mouth. Is it a form of green man? 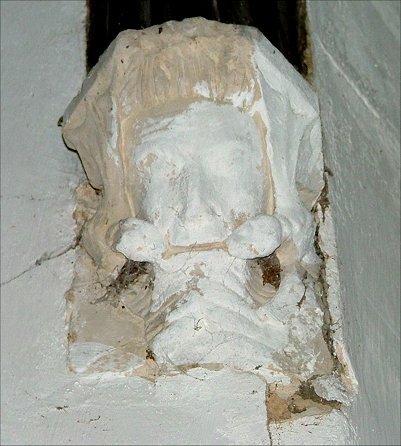 That in the north-west corner of the nave, where they are much bigger, appears to have muttonchop whiskers. When you look closely, however, he has a tiny dragon either side of his face, and the dragons lean forward as if to kiss him. It is like something out of a nightmare, or a Harry Potter film, whichever is worse.